Friday was a gorgeous day, temps nearing 60, it felt like spring was truly on the way. It was not to last, of course, as temps dropped back to the 30s on Saturday, joined by 50 MPH winds. Crazy stuff! Friday evening, while it was still relatively temperate, I hoped for one of those beautiful post-sundown navy blue skies as I had a particular subject in mind that would work perfectly in that setting. Instead an overcast built itself up over the course of the afternoon and I had no shot, or so I thought. By the time I left the office, the clouds had broken apart just enough to allow the setting sunlight to poke through and light them in a beautiful pink glow. 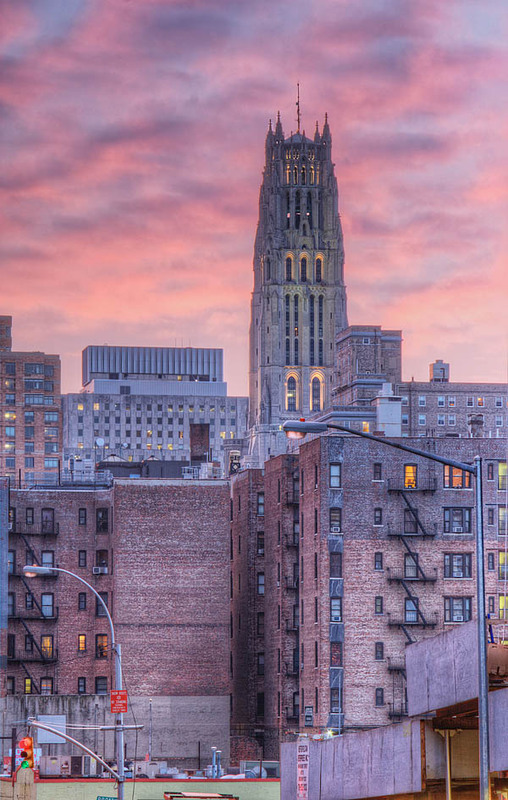 I’d been waiting to get a good image of Riverside Church’s bell tower and this was my chance. I hustled up the hill to Broadway, set up and got a couple of good shots, including this one. A funny thing happened while I worked on this image. I was standing under the elevated subway trestle and the camera was pointing in a south western direction toward the church. A black Crown Victoria pulled next to me, the driver asked me if “I was taking pictures” (he looked like Dwayne “The Rock” Johnston, by the way) and told me people get scared when they see someone with a camera under the tracks. Meanwhile, the car wasn’t marked and I didn’t see a badge so I don’t know who the guy was but he took off after a quick conversation. I don’t know, I would think a terrorist would attempt to be somewhat less conspicuous than to stand in an intersection with a tripod and attract attention. It’s been a rough couple of weeks, weather-wise. I had wanted more snow, severe winter weather we had, but it was mainly a mixture of wet snow and freezing rain plus freezes and thaws. The result of all of this was piles of ugly frozen black slush lining the roadways. Adding in consistent gray skies and extreme cold weather, it was tough to get outside to do any photography. Inspiration has been at a low ebb. Case in point. 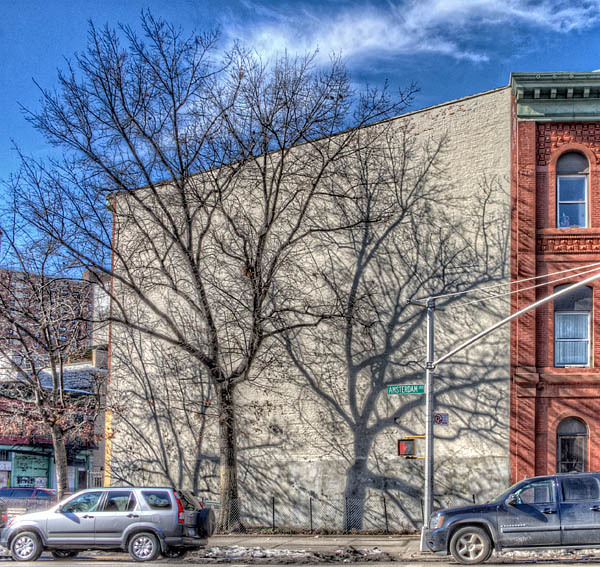 I had walked past this building on Amsterdam Avenue during a lunch hour walk in December and appreciated the shadow these tree cast on this blank wall. I didn’t have my camera at the time and made a mental note to return. Weeks passed until I had my camera and tripod in the office and enough enough sunlight to cause acceptable shadows on the building for images of the place. Friday was sunny and relatively warm and I jumped at the chance. The site itself is somewhat unusual as open footage in Manhattan is at a premium and here we have a couple of trees in a small lot on Amsterdam Ave. and 126th Street. I have walked past this place numerous times on my way to a nearby library and knew it was old but didn’t put two and two together to realize it had been a firehouse. The 1881 building designed by Napoleon LeBrun housed Engine Company Number 37 and is now the Templo Biblico church. I have never seen the church open so I haven’t had a chance to chat with the pastor or other workers. I assume it’s mainly active on Sundays. I often wonder if the people who use these re-purposed buildings have any idea of the history of these places. I wish it were so. Any place, no matter how nondescript may have an interesting story to tell, if only the time were taken to investigate. Then again, it may simply be a boring pile of bricks!